The enormous chipboard-and-canvas village has been dismantled and diplomats have caught up on long-deferred sleep. 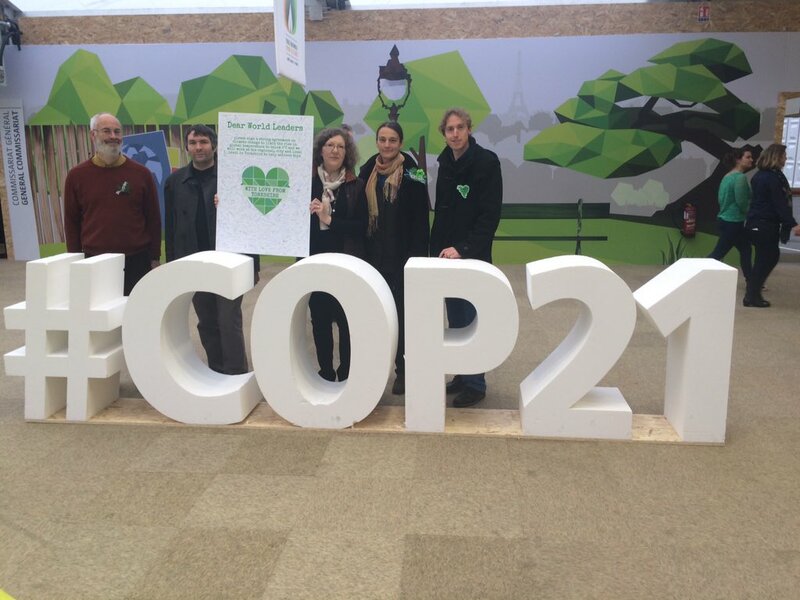 The COP21 summit in Paris was an intense period for tens of thousands of civil society activists too. 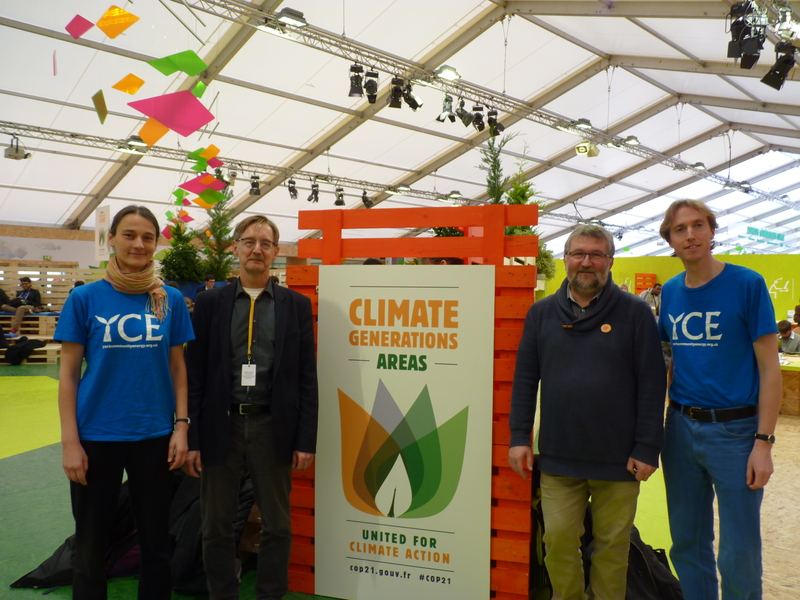 Those making the trip from York included members of the Stockholm Environment Institute, Zero Carbon Yorkshire, the Joseph Rowntree Foundation, Global Justice Now and representatives of York Community Energy too. The fraught wrangling over the official text in a purpose-built tent village at Le Bourget was doubtlessly the main event. 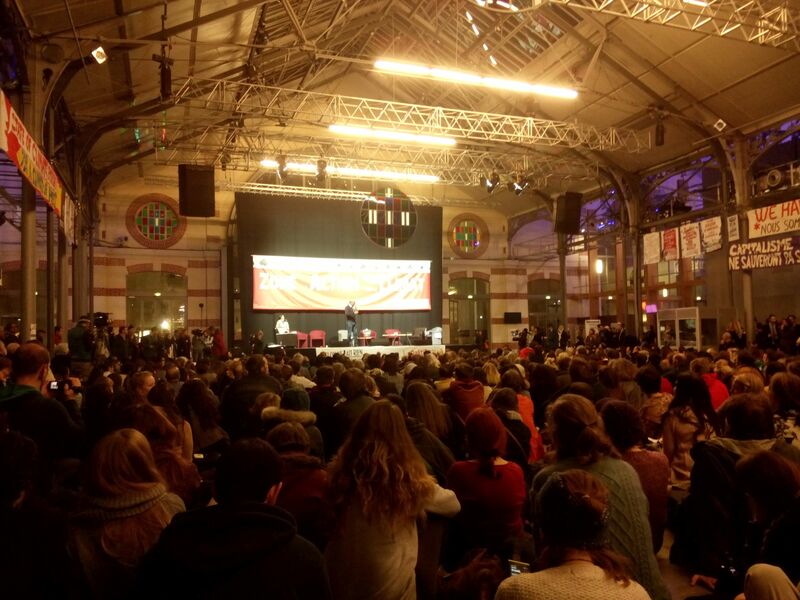 But our programme was pretty packed too: a Citizen’s Summit, a week-long Climate Action convergence centre, the official Climate Generations programme, and, of course, the opportunity to call out the negotiators on their abundant low ambitions through debates, stunts and protests. Why protest? The talks ended with a declaration that has been hailed as a historic agreement, defining our commitment to keep the average global temperature from rising more than 2°C, and our aspiration to keep it within 1.5°C. But the triumphalism is pretty hollow. If you read the text, there are no binding targets, no deadlines and no sanctions, just plenty of aspirations and endless new subcommittees and reporting mechanisms. It acknowledges that the current plans of its constituent countries will not limit the temperature rise to anything like 2°C – initial analysis shows it will be more like 2.4 to 3.9°C. It does not call for fossil fuels to be left in the ground, for the rich to repay the moral debt they owe to vulnerable developing countries, or for deforestation to stop. It is, in short, pretty much what we expected. The Citizen’s Summit for the Climate was a weekend event held in Montreuil, a town outside Paris proper but conveniently at the end of one of the metro lines. 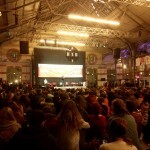 The programme was absolutely packed, with 50 sessions in four venues taking place on the Saturday morning alone. It was colourful, energetic, noisy and extremely educational, bringing together campaigners and NGOs from across the world to discuss how we can respond to the threat of climate change. As well as the standard workshops, presentations and seminars there were stalls, processions, artworks, music, a huge farmers market and campaigners on every subject imaginable (a campaign for electrified motorways?). 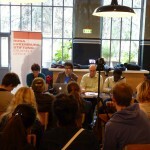 The theme continued into the following week at the Climate Action Zone in the Centquatre arts centre in the north of Paris, where the programme was less packed but more balanced toward culture, creativity and protest. 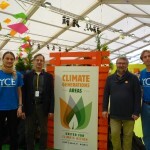 Making the trip between the official “Climate Generations” civil society zone at Le Bourget and the Climate Action Zone in La Villette involved a bit of a switch in mindsets. Climate Generations had the indoor, squat, airless, artificial-light ambience of a supermarket. The Centquatre was a beautiful, high-ceilinged building with abundant natural light, a huge central space and an open courtyard where artworks literally roamed free. The architecture well reflected the spirit of each. Much of the time, being active on climate issues means protest, opposition and criticism, but community energy is one of a few notable exceptions to this. The sessions on community energy and energy democracy were consistently well attended by campaigners both from the developed and developing worlds – keen to compare notes, learn from each other and work together. The value of having citizens as active participants in the energy systems that support them, rather than passive consumers, resonates across cultures. In the West, campaigners want a way of engaging the public in energy issues, driving the reduction in consumption that we know is needed. In developing countries, the availability of power is frequently patchy or dependent on fossil-fuel powered and polluting generators. 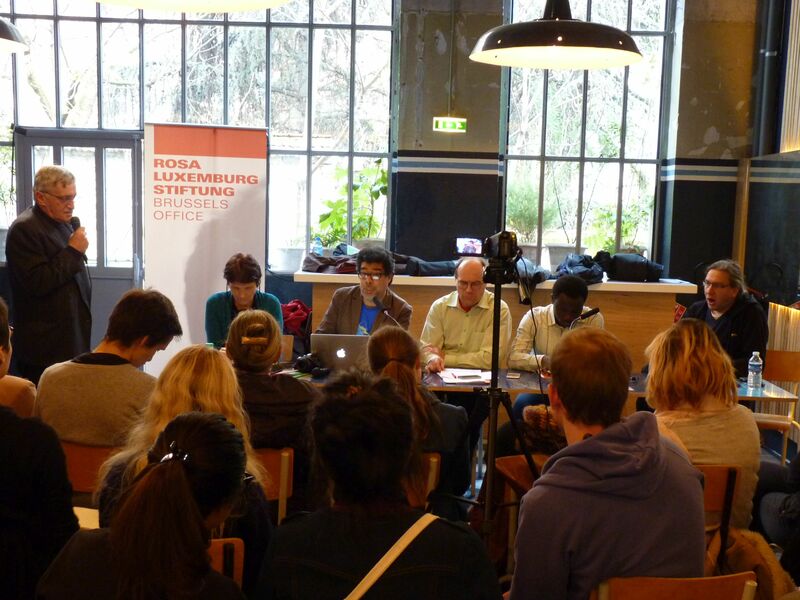 We had the chance to speak to community energy activists from Germany, Denmark, Nigeria, Uruguay, France, Mauritius and Belgium. We came away with heads bulging and our conviction in the importance and relevance of community power stronger than ever. Can renewable co-operatives drive energy efficiency? Yes – in Belgium, the 50,000 members of the Ecopower co-operative have reduced their energy consumption from the grid by 50% over the past twelve years. In Germany local municipalities have taken over control of their grids, with the city of Hamburg creating the new public renewable generation utility Hamburg Energie, which is fully accountable to the population – half of the board are directly elected by a public vote. One clear distinction in cultural approach emerged clearly – the different attitudes to public ownership. In Germany and Latin America the agenda is clearly in favour of public ownership, with the social equity and public accountability that this brings. Uruguay’s famously 95% renewable electricity grid (aiming for 100%) has for the last two years made a loss, but this is not the point: its goal is the wellbeing and welfare of its users. In one debate, Professor Alain Caillé described the drive to liberalising the grid to accommodate community co-operatives selling to customers as “essentially a neoliberal idea”. 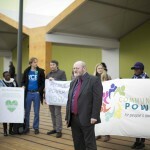 But in Nigeria, Pakistan, and indeed the US and the UK, the movement is clearly based on communities taking control in spite of local authorities or national governments who are either too distant, diminished, poorly motivated or plain corrupt to lead the transition to low-carbon energy. The challenges that community energy faces across the world are very different but have some striking things in common: the existing infrastructure (both physical and legal) that underpins our fossil-fuelled power grids, powerful lobbying by the extractive industries which has captured government policy in much of the world, and the need to secure finance to start up schemes – without being captured ourselves by investors. Whilst YCE could potentially endorse this agenda, it’s clear that this is not the mission that we have set ourselves. We aren’t publicly owned, and we don’t expect to be able to supply energy to consumers directly ourselves. But this manifesto reminds us that there is a bigger picture than simply generating renewable energy. Whilst renewable energy usually makes a positive contribution to the climate, it has social impacts that must be considered – land use, social equity and accountability to name but three. I hope this leads to some lively discussions perhaps at our next AGM! The climate crisis requires a collective global response, and YCE will continue to think globally as it acts locally, as the old dictum goes. 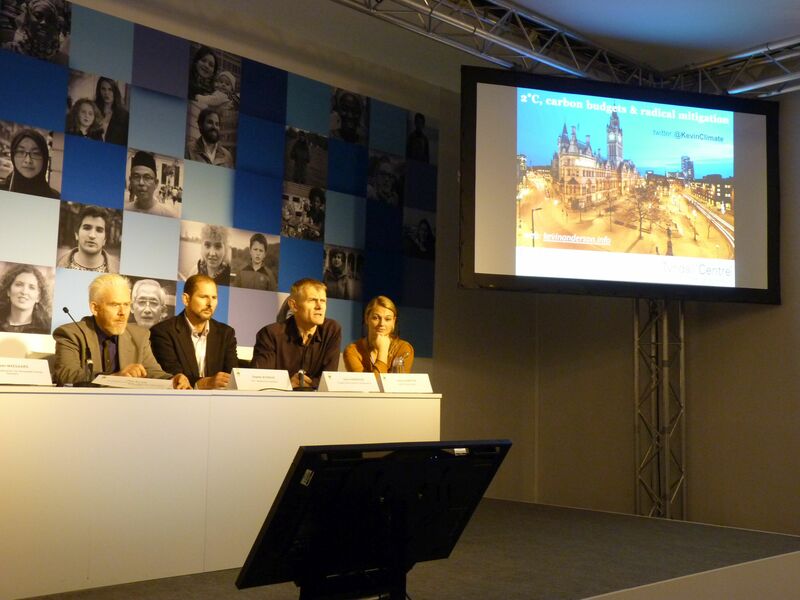 REScoop is the federation of citizen-controlled energy groups across Europe. We are keen for our own network, Community Energy England, to affiliate with this. 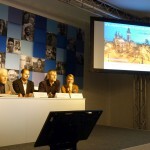 One outcome from meetings in Paris was the possibility of setting up a worldwide association for citizen-controlled renewable producers. Whilst putting solar panels up in York may seem a very distant effort to the struggles of the Nigerians towns whose economic survival may hinge on the intermittent electricity produced by the privatised grid, or the Indian farmers locked out of common grazing land for a mega solar-farm funded by rich governments through the Clean Development Mechanism, we must consider ourselves connected to their efforts. Developed countries bear a heavy carbon debt, and we must all look for ways to repay it even as we clean up our own act. 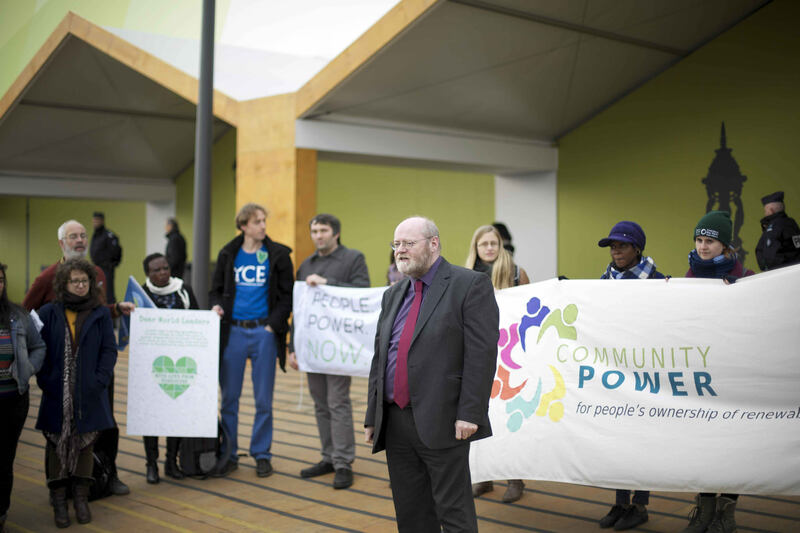 Community energy is a worldwide revolution in the making – what it delivers is up to us. 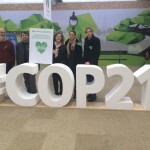 UPDATE: I was also interviewed about COP21 for the Sustainable Futures Report podcast – listen online or download here.